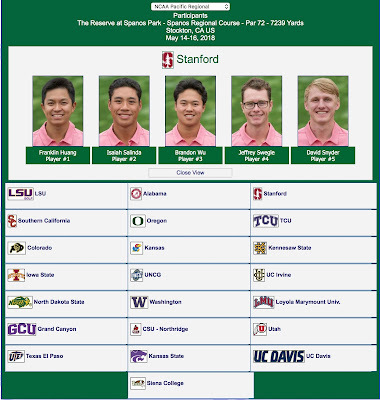 STOCKTON, Calif. – Coming up big when it mattered most, the third-seeded Stanford men's golf team fired a final-round 11-under-par 277 on Wednesday to finish second at the NCAA Pacific Regional and advance to the tournament proper, May 24-30 at Karsten Creek Golf Club in Stillwater, Oklahoma. Led by junior Brandon Wu, who placed second overall, the stellar last day score was the lowest by any team during the 54-hole tournament at The Reserve at Spanos Park. "I kind of challenged the guys last night to try and win the tournament and they almost did," said Conrad Ray, the Knowles Family Director of Men's Golf. "Winning the day is a great accomplishment and should give us some confidence and momentum." It marks the 11th time in the last 14 years that Stanford has qualified for the NCAA Championships. The Cardinal owns eight titles, the last achieved in 2007. 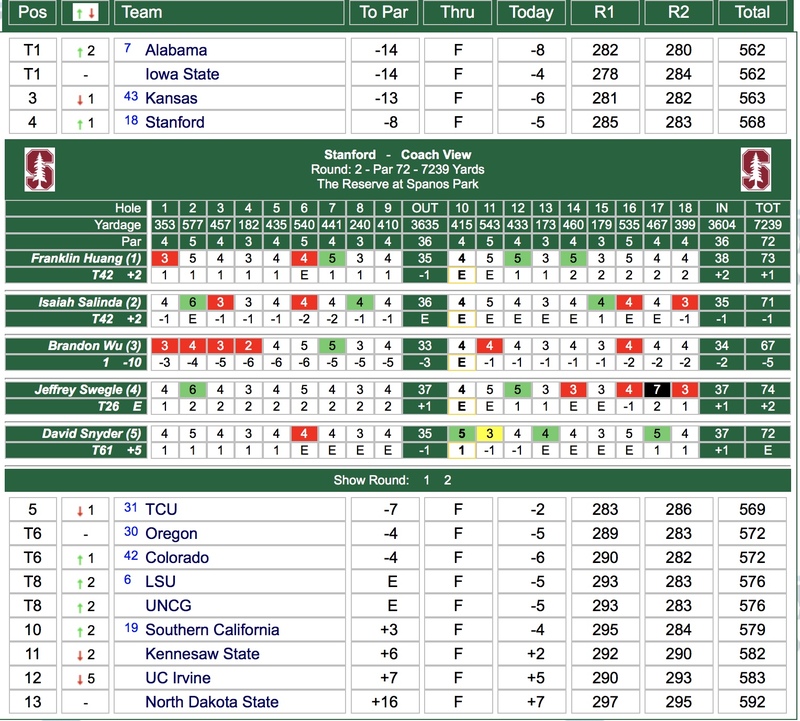 Stanford entered Wednesday's final round in fourth place and knew it needed a solid showing to earn one of five spots in the 13-team field to move on. Starting on the back nine, junior Isaiah Salinda set the early tone by blitzing the side in 5-under 31. "He got it going and everyone was feeling the vibe," Ray said. "It was really good to see him make some putts." The Cardinal nearly caught frontrunner Kansas on the final hole to capture a share of its third consecutive regional crown. Wu burned the edge of the cup with a birdie putt that also would have tied Norman Xiong of Oregon for medalist honors. 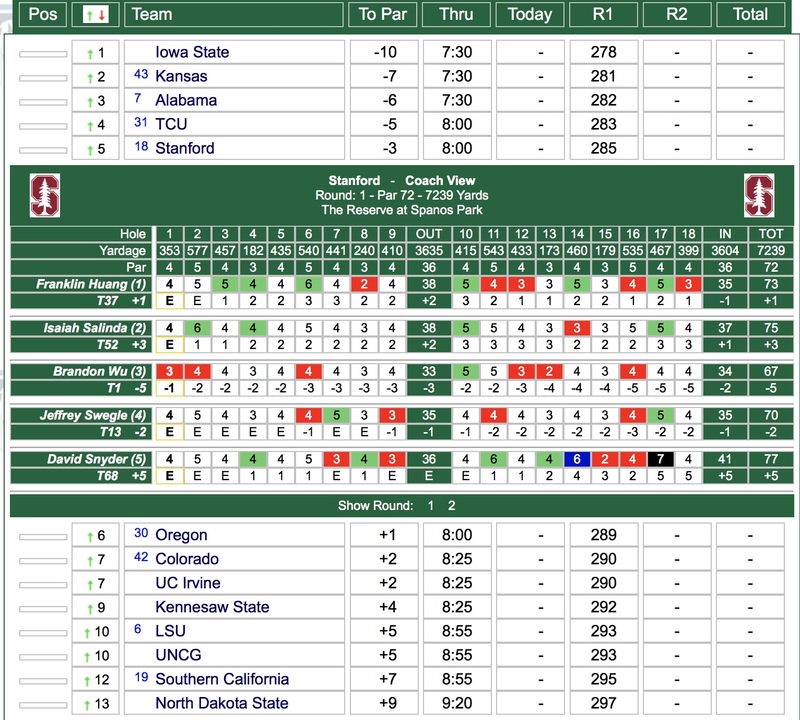 Stanford posted rounds of 285-283-277 to conclude at 19-under 845, one shot behind the Jayhawks. Iowa State (847) took third, followed by Alabama (849) and Oregon (852). Wu, an All-Pac-12 first team selection, matched his best-ever finish at Stanford. He played brilliantly from start to finish, shooting rounds of 67-67-68 to card a career-best total of 14-under 202. He made only four bogeys. Playing with Xiong on Wednesday, Wu eagled the par-5 11th, his second hole of the round, and shot a 1-under 35 on his opening nine. On the back side, Wu birdied 1, 5 and 7 to record a 3-under 33. "It was kind of blow by blow," said Ray of the Wu-Xiong battle. Xiong two-putted for a par on the final green from about 15 feet to secure the win. Wu tied for second at last year's NCAA Regional Championships. This week's performance was his fourth top 10 of the season and the fifth time in 11 starts this season that he has paced the Cardinal. 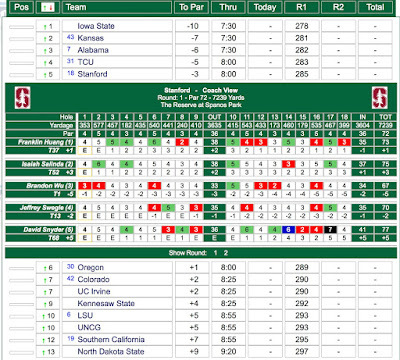 Three other Stanford players broke par, as Salinda (t-23) and David Snyder (t-43) shot 69's and Franklin Huang (t-37) a 71. Jeffrey Swegle (t-37) added a 73. Impressively, the Cardinal was a combined 4-under on the last nine. "It was a good team week," Ray said. "They all kicked in at one point." Snyder, a sophomore, rebounded from a first-round 77 to break par each of the last two days. On Wednesday, he forged an eagle and four birdies to fashion his lowest round versus par on The Farm. "He's a grinder," said Ray. "I'm really happy for him." Stanford was one four Pac-12 schools to advance from six regional sites and will join Oregon, Arizona State and UCLA in the 30-team field in Stillwater. 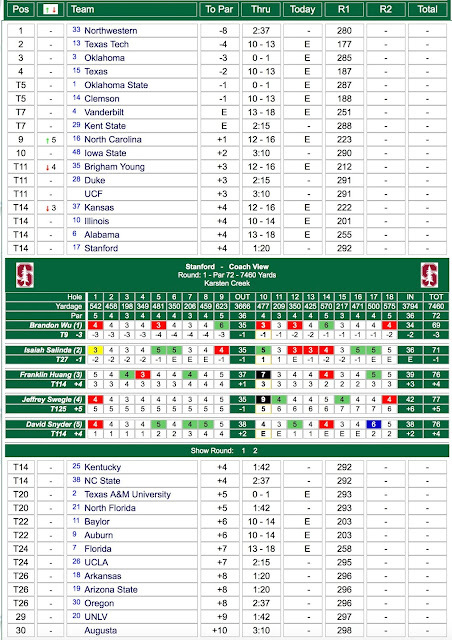 Scoring results including round 3 Stanford scorecards are shown below - click on image to enlarge. STOCKTON, Calif. – Riding another stellar performance by junior Brandon Wu, third-seeded Stanford improved one spot Tuesday in the NCAA Men's Golf Pacific Regional at The Reserve at Spanos Park. Wu fired his second-straight 5-under-par 67 and leads the individual competition with a 36-hole score of 10-under 134, one stroke ahead of Norman Xiong of Oregon. The Cardinal tallied a four-player total of 5-under 283 – two shots better than Monday's opening round – and resides in fourth place with a two-day score of 8-under 568. 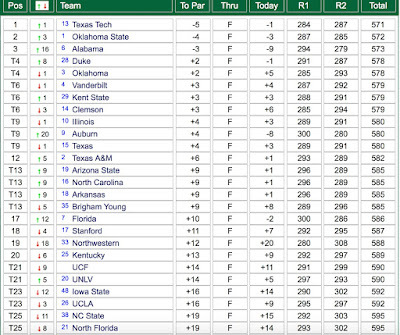 Alabama and Iowa State share the top-spot at 14-under 562, followed by Kansas State at 13-under 563. 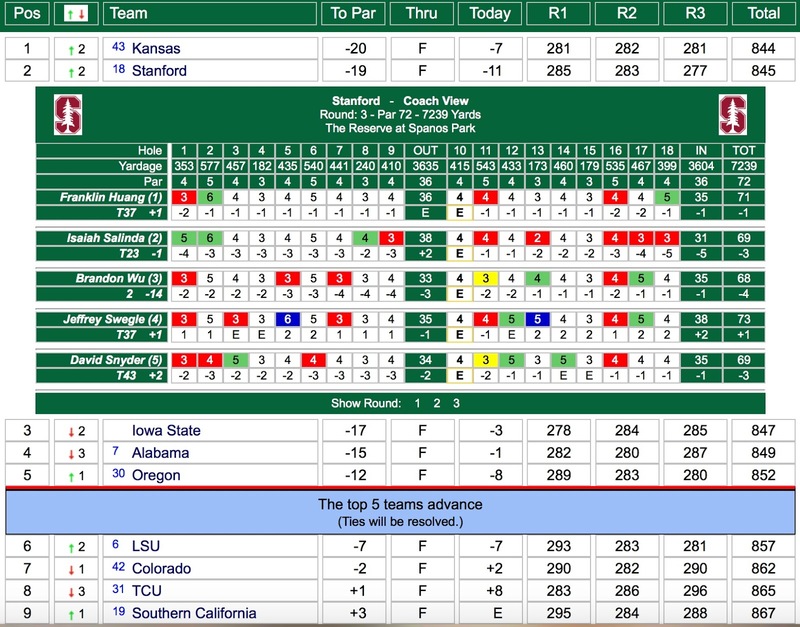 TCU is sixth at 7-under 569, while Colorado and Oregon share sixth at 4-under 572. The final round will be played Wednesday, with the top five teams and one individual not a member of an advancing team moving on to the NCAA Championships, May 24-30 at Karsten Creek Golf Club in Stillwater, Oklahoma. For the second consecutive round, Wu fashioned six birdies and one bogey. Starting on the back nine, he recorded birdies at the par-5 11th and 16th holes, and made the turn in 2-under 34.
then parred the last two holes for a 3-under 33. Junior Isaiah Salinda parlayed four birdies into a 1-under 71, while sophomore David Snyder added 72, eagling the par-5 11th hole. 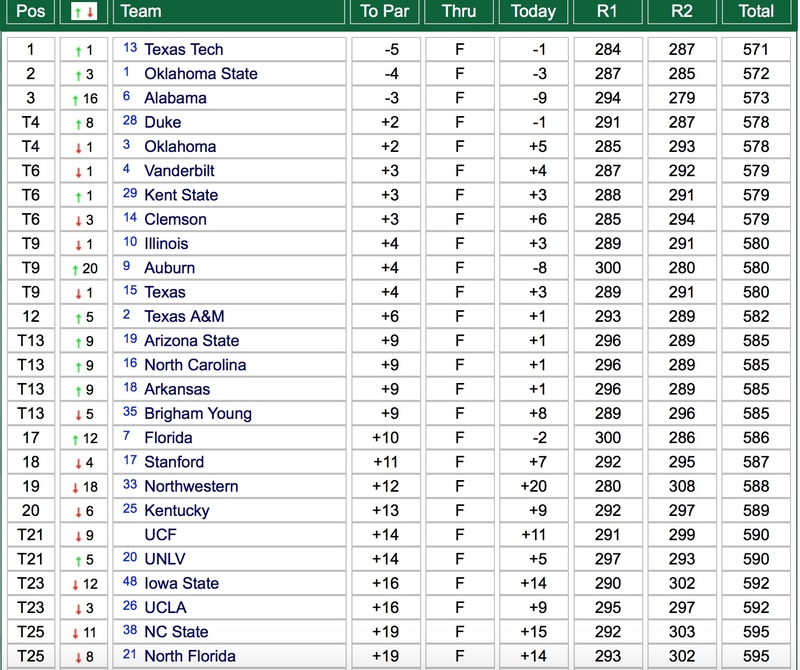 Senior Jeffrey Swegle (144) is tied for 26th, while Salinda and senior Franklin Huang (146) are knotted for 42nd. Snyder (149) is tied for 61st. 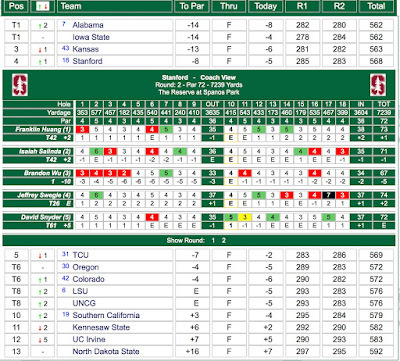 Stanford begins final round play Wednesday at 8 a.m. PT off the 10th and will play with Oregon and TCU. 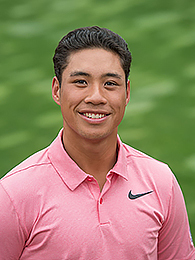 STOCKTON, Calif. – Brandon Wu carded a 5-under-par 67 to help third-seeded Stanford place fifth on Monday in the first round of the NCAA Pacific Men's Regional Golf Championships at The Reserve at Spanos Park. The Cardinal combined for a best four-out-of-five score of 3-under 285 in the 54-hole stroke play tournament. 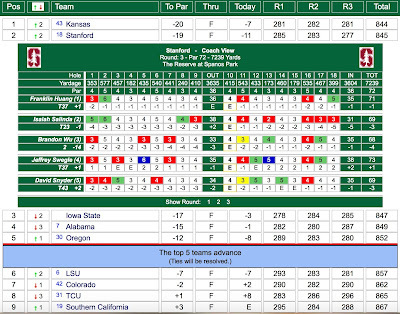 Iowa State leads at 10-under 278, followed by Kansas (281), Alabama (282) and TCU (283). "I think we all felt pretty good about today's first round," said Conrad Ray, the Knowles Family Director of Men's Golf. "They guys hung in there with some early tough conditions. It was chilly and very windy." Teeing off early, Wu started strong with birdies at the first and second holes. He added another at the par-5 fifth and turned in 3-under 33. Wu sustained his only bogey of the round at No. 10, but followed with birdies at 12, 13 and 16. He was a combined 3-under on the par-5's and is tied for second, one stroke behind pacesetter Carl Yuan (66) of Washington. The 67 matched Wu's third-best round of the season, topped by a 6-under 65 at the Nike Golf Collegiate Invite. It was also his 13th round in the 60's. "Very solid round," Ray said. "His lone bogey was a three-putt from long distance." The Cardinal received a 2-under 70 from senior Jeffrey Swegle, who fashioned four birdies and two bogeys and is tied for 13th. Senior Franklin Huang birdied two of his last three holes to shoot 73 and is tied for 37th, while junior Isaiah Salinda (75) and sophomore David Snyder (77) are tied for 52nd and 68th, respectively. Stanford, seeking its third consecutive NCAA regional crown, begins second round play Tuesday morning. Thirteen teams are competing, with the top five and low individual not a member of an advancing school qualifying for the NCAA Championships, May 24-30 at the Karsten Creek Golf Club in Stillwater, Oklahoma. "I think our guys felt like they left a few shots out there," said Ray. "I expect tomorrow to be a solid day with a chance to move up the leader board." The Cardinal will play with Oregon and TCU, and tees off between 8:00 and 8:44 a.m. PT on the 10th tee. STANFORD, Calif. -- Stanford makes its 20th consecutive post-season appearance next week at the NCAA Stockton Regional at The Reserve at Spanos Park in Stockton, California, hosted by the University of Pacific. The third-seeded Cardinal is seeking its third straight regional crown and sixth overall, previously winning in 1996, 2010, 2015, 2016 and 2017. In 10 of the last 13 years, Stanford has advanced to the NCAA Championships. "There will likely be some low scoring if the wind doesn't blow or if the rough isn't up, but we'll see what it gives us and go from there," said Conrad Ray, the Knowles Family Director of Men's Golf. "The Regional is always a test no matter where you play or what type of season you've had. We are trying to win the golf tournament just like any other and create as much positive momentum as we can." Stanford, ranked 13th, is one of 13 teams vying for five spots in the NCAA Championships, May 24-30 at Karsten Creek Golf Club in Stillwater, Oklahoma. There are five other NCAA regional qualifiers. The Cardinal finished the regular season with several strong performances against stellar competition, placing third at The Goodwin, sixth at the Western Intercollegiate and fourth at the Pac-12 Championships. 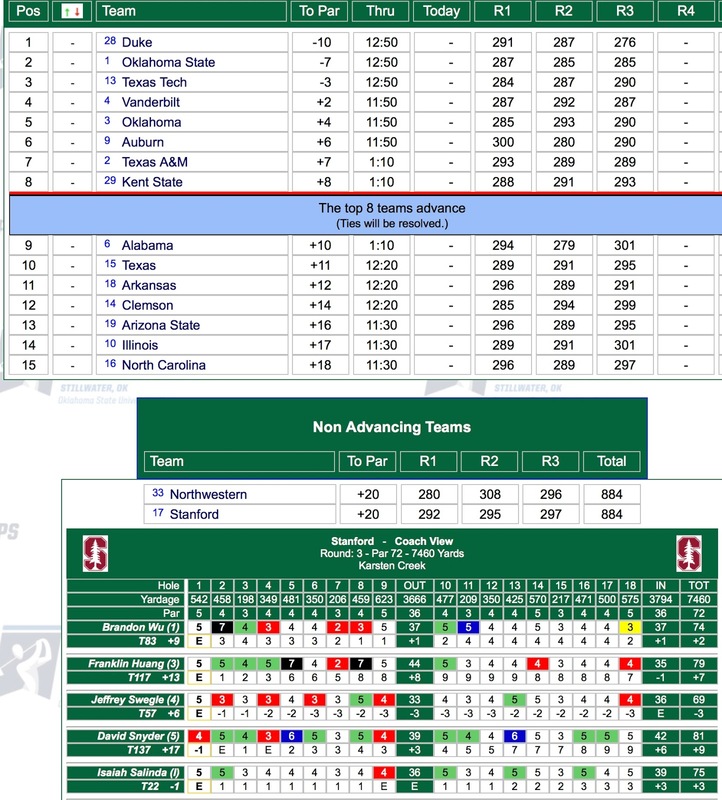 Stanford has produced five top five finishes. This year, a new substitution rule can be used at the regionals and NCAA Championships. Head coaches will be allowed to replace a player prior to any round due to a physical ailment or poor play. "We have good depth, so we will likely bring an extra player," Ray said. "Most of the time it will be based on injury or if someone is struggling, knowing the goal is to advance." The Reserve at Spanos Park • Stockton, Calif.
• The team field includes No. 1 LSU. No. 2 Alabama, No. 3 Stanford, No. 4 USC, No. 5 Oregon, No. 6 TCU, No. 7 Colorado, No. 8 Kansas, No. 9 Kennesaw State, No. 10 Iowa State, No. 11 North Carolina-Greensboro, No. 12 UC Irvine and No. 13 North Dakota State. • The event spans three days and features 54 holes of stroke play. Team scores will consist of the cumulative total of its four best scores out of five per round. The low five teams and top individual not a member of an advancing team qualify for the NCAA Championships, May 24-30 at Karsten Creek Golf Club in Stillwater, Oklahoma. 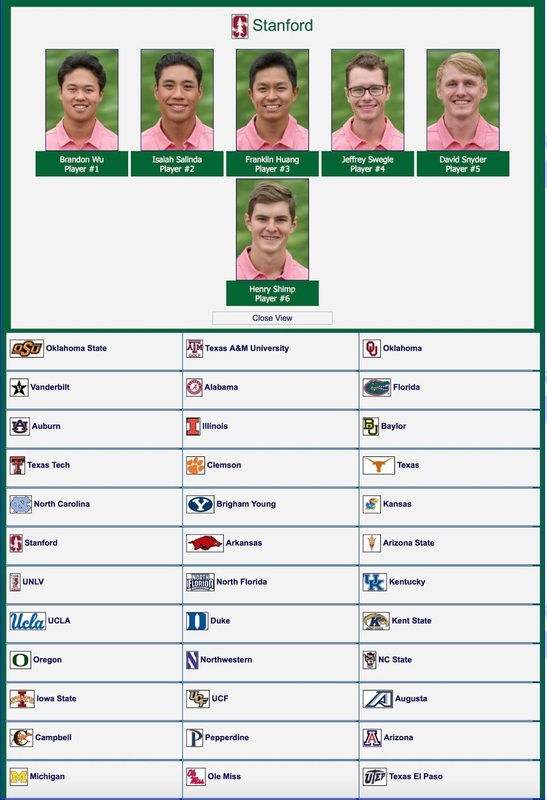 • Stanford begins first round play on Monday from 7:30 a.m. to 8:14 a.m. PT on the first tee with LSU and Alabama. Second and third round pairings will be determined by team scores, with times running from 7:30 a.m. PT to 10:04 a.m. PT. 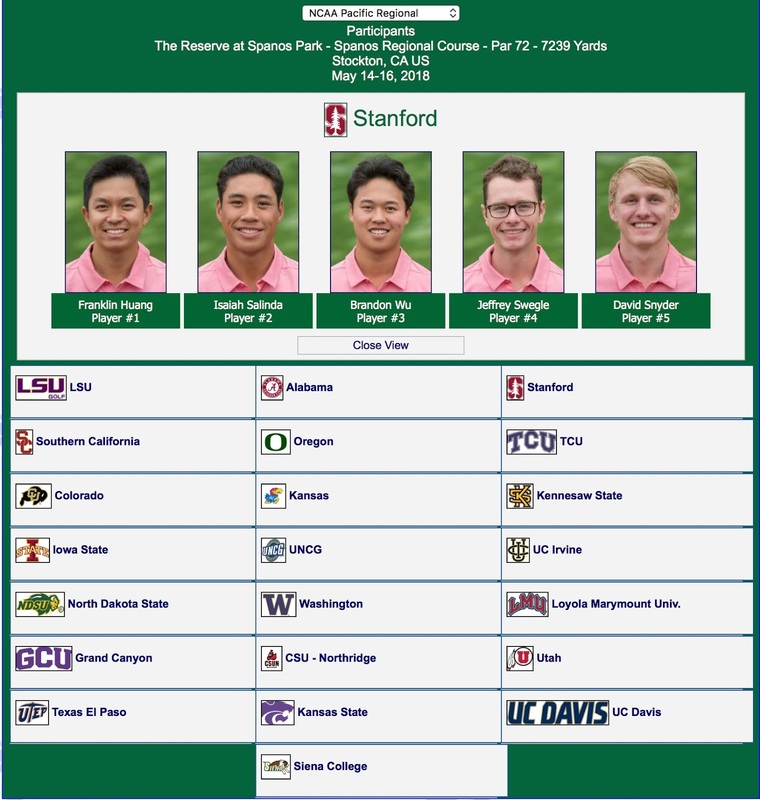 • Stanford will be represented by senior Jeffrey Swegle, senior Franklin Huang, junior Brandon Wu, sophomore David Snyder and junior Isaiah Salinda. Sophomore Henry Shimp is the alternate. • Franklin Huang won individual honors at the 2016 NCAA Tucson Regional in Marana, Arizona. 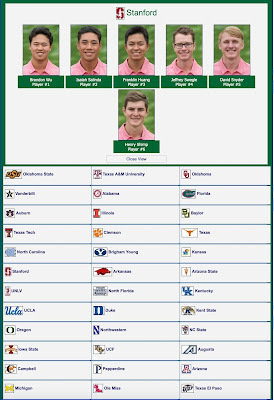 • Stanford is participating in the NCAA Regionals for the 20th consecutive year. The Cardinal has captured two straight regional crowns and six overall. • In 2017, the Cardinal shared the NCAA Stanford Regional title with Baylor at Stanford Golf Course. Brandon Wu and Franklin Huang tied for fourth individually, and Isaiah Salindafinished 20th. The Reserve at Spanos Park opened in 1999 and was designed by Andy Raugust. It measures 7,239 yards from the championship tees and plays to a par-72. The course is located on a mostly flat, 360-acre site that includes seven lakes, natural wetlands and working farmland. The bent grass greens are small and quick, made even more challenging when the wind blows.